Farrell spoke once again of how much of a privilege it is to coach this organization and said that it has always been his dream job. He has already said that his team will speak with “one voice” meaning that there won’t be any he said/she said, behind the back talk like when Bobby V was here. He already began re-establishing old relationships with players that have already played for him while he was our pitching coach from 2007-2010. I found it interesting in a poll conducted last week that so many people did not like their choice in manager. Many people also voted that only time can tell. 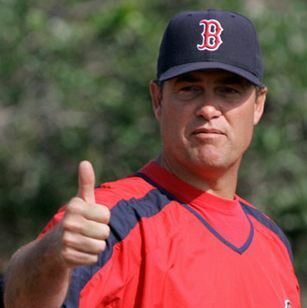 Only a small majority actually liked the Sox decision to scoop up Farrell. What do you think? This entry was posted in Red Sox and tagged A-Rod, AL, al east, ALCS, ALDS, american league, Babe Ruth, Ball, Base, baseball, Bat, Beckett, Ben Cherrington, blue jays, Bobby Valentine, BoSox, boston, boston red sox, boston sports blog, Bronx, coach, Damon, Ellsbury, Fenway Park, Field, giants, Gonzalez, Inning, jeter, john farrell, John Henry, Luxury, Major League, Massachusetts, Minor League, mlb, National League, NL, NLCS, NLDS, orioles, ortiz, pedroia, Pennant, Pitch, players, Race, rays, Sox, Strike, theo epstein, Tigers, Varitek, world series, yankees by christoph131. Bookmark the permalink.